We’re told game design has to be unsentimental and iterative. But Viktor Antonov, creative director on Bethesda’s Battlecry and the celebrated artist of behind Half-Life 2’s City 17 and Dishonored’s Dunwall, disagrees. “I come from a less experimental philosophy and a commitment to a strong concept,” he said. “If you’re called by a client as an architect and you make a building, you won’t experiment and destroy buildings before it’ll function. 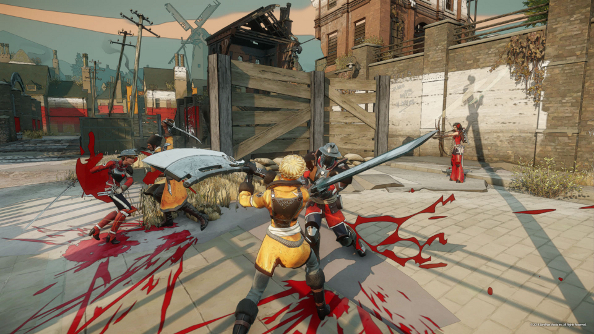 Battlecry is a multiplayer combat game played in third-person. Set at the turn of a 20th century where the great empires have given up the bomb, the game finds European leaders eschewing the barbarism of World War 1 and the chemical and nuclear weapons to follow. Instead, international disputes are settled in designated warzones by professional soldiers (“They’re going to be sacrificed anyway,” reasons Antonov). Squint a bit and you can sort of trace the origin of Battlecry’s distinctive art through Viktor’s previous work. Its maps bear the Eastern European hallmarks and uncomplicated textures of the designer’s best work. Industrial machinery coats imperial architecture, just as totalitarianism blanketed Dunwall and City 17 before it. As in Antonov’s concept work, nothing is erased – only added to. One identity sits on top of the other. Antonov describes his trademark Eastern European aesthetic as “exotic”, though he grew up in Bulgaria himself. He refers to Ukraine and Russia as “eastern frontier territory” – Europe’s Wild West. “It has great mythology and it’s not represented enough,” he explained. “I have a specific knowledge of these areas and I almost feel like it’s a duty as an artist to bring these to the table and show it to people. It’s fresh and diverse and breaks the whole, ‘Everything takes place in New York and LA’ in entertainment. Antonov was adamant that Battlecry convey the “glory” of period films from the ‘70s: the flavour of an old, great Europe destroyed in the First World War. Consequently, the game’s characters look like contemporary cossacks. The designer is especially proud of the fact that their uniforms “ring bells” from real history, but prove entirely fictional under closer inspection. But those same characters also reflect a “very deliberate” slant towards gender diversity (“We’re not afraid of having powerful women in the game”). 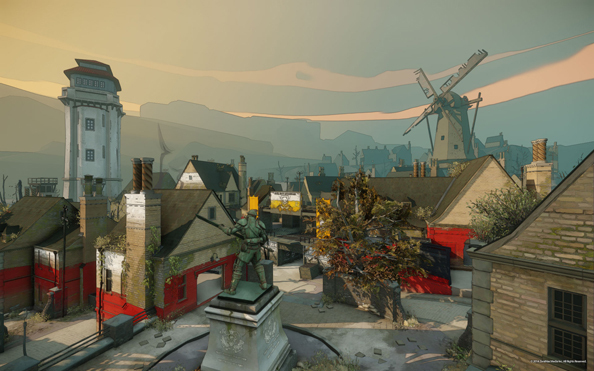 The designer was determined that the game’s setting didn’t render it a “boring historical piece”. “These armies have both men and women, and you have all these gadgets and mechanical things, so it’s a science fiction piece,” he said. It’s clear Antonov is enjoying the reduced scope of a competitive multiplayer game. Rather than split his time between 20 levels and fifty NPCs across a 15 hour game like Half-Life 2 or Dishonored, he’s been able to lavish his attention on just two or three levels and ten characters. Antonov’s ethos comes from industrial design. Like the buildings in his games, his concepts convey an identity, and are drawn in hard, indelible lines. Only once they’re finished is anybody allowed to build on top of them. “In a lot of video games there’s iteration that goes on, but the stronger the core concept is the better the product is. 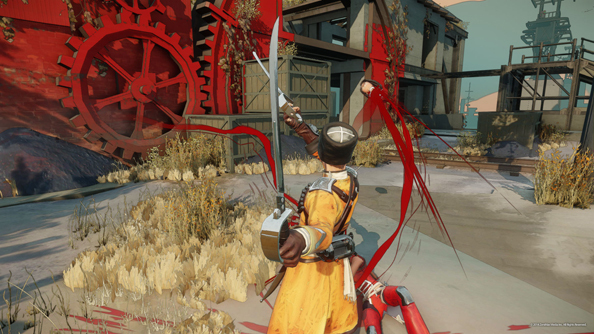 Iterating forever leads to weakness,” he told PCGamesN. Antonov talks often about weakness. It’s something he’s given plenty of thought to since starting work on a free-to-play project – aware that bought skins, event weaponry and novelty hats can dilute the DNA of a game beyond recognition. Not every aspect of designing a multiplayer game is so suited to Antonov’s method, though. 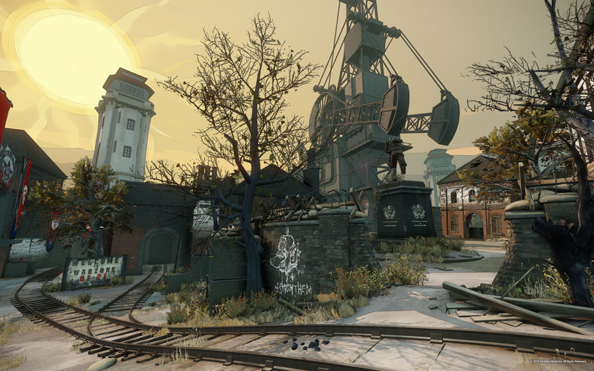 The process of redirecting level design to fit Battlecry’s combat experience is inevitably iterative, and the only element of a map not subject to constant reworks is the sky. It seems no coincidence that Antonov is investing so much of his time and strongest symbolism there. At the end of every match, the sun goes down. Once the fighting’s over, the light “bleeds into the clouds” – a rare, sentimental constant in an ever-changing environment. No wonder Antonov likes the sunset.